The New Black, a neo noir anthology by Dark House Press, edited by Richard Thomas. The New Black drew me in quickly and held my interest from cover to cover. Although I often read a few books at a time, mixing them up, I kept reaching for it. This is a boundary breaking anthology that hopefully gets the attention that it deserves- a book with the appeal of genre fiction, but the quality writing of literary fiction. Thomas shows us that literary writing style can compel a story along. The New Black also demonstrates some of the range possible with neo noir. The New Black reflects that genre writers can be literary and literary writers can work within a genre. Hemingway and Fitzgerald wrote to the popular culture and now are considered literary. To that end, The New Black takes us back a century and hopefully helps moves us forward in the next decade. Stoked to announce Shotgun Honey accepted my crime story- The Collection- for publication. Happy to anounce that my short story Trinket is out in Sanitarium Magazine #23. This story has a Lovecraftian inspiration and is available now in Digital and Paperback on Amazon. My story The Gift was accepted by the literary magazine The Stray Branch, and will appear in a future issue. My story Into the Darkness has been accepted by Voluted Tales Magazine for its special edition The Darkness Internal, edited by Christopher Nadeau, featuring dark Kafka like stories and more. 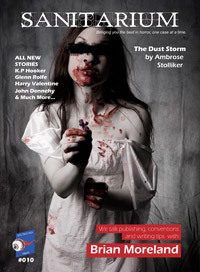 July 20, 2013, UK horror publisher Sanitarium Magazine has published my story Cast Out, available in electronic version or in a paper chapbook. July 19, 2013, International speculative fiction publisher SQ Magazine accepted my story Finders Keepers and will come out on September.